The program is for women who are addicted to alcohol and other drugs. There will be ten to twelve adult women in the new treatment facility with around the clock staff. The goal of the program is to help women who truly want sobriety, and a better life for themselves and their families. 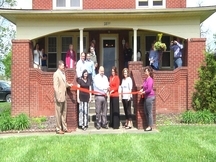 â€œThis is our grand opening for our facility in Muskingum County. We use an evidence based practicum that teaches them tools and skills they need to live their lives sober,â€ said Wendy Gatewood, Associate Director for the Inpatients Programs. Barry Bennett, Executive Director at Pickaway Area Recovery Services, said that these addicts come from a completely unstructured environment to a completely structured environment from day one of starting the program. â€œOur clients learn how to schedule. When they leave here, they have to schedule every hour of every day. They will do it in spite of how they feel. So if they schedule four AA meetings next week theyâ€™re going to go,â€ said Bennett. Bennett said that their methods they practice has been proven to work and has had a huge impact on their patients lives. He said that scheduling is a very effective method in helping someone recover from addiction, he says most of the people who relapse are those who do not follow a strict schedule in their life.